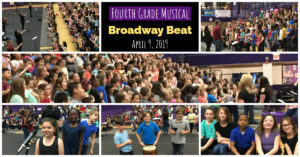 Fourth graders from every elementary school in Collinsville Community Unit School District #10 joined together on Tuesday, April 9, 2019 to present “Broadway Beat: Musical Highlights from Over a Century of Song and Dance” in Fletcher Gymnasium at Collinsville High School. The students were under the direction of elementary music education staff Jennifer Bhooshan, Cathy Hughes, Megan Schmid, Ryan Stack and Emily Thoman. Kreitner Principal Dr. Todd Pettit was master of ceremonies. The performance included well-known songs from popular musicals. Between songs, Dr. Pettit outlined the CUSD 10 music program for parents and guests. He said when students enter Dorris Intermediate School, they can further explore interests in vocal music and band. DIS Band will have an introduction night for incoming fifth-graders and families on Wednesday, April 24, 2019 at 7:00 pm in the school gymnasium. Students will find out how to join band next year, test out and choose an instrument, meet the district’s band directors, hear current band musicians perform and learn about the CUSD 10 band program. For questions please contact Mr. Calza, the DIS band director, by email: ncalza@cusd.kahoks.org.